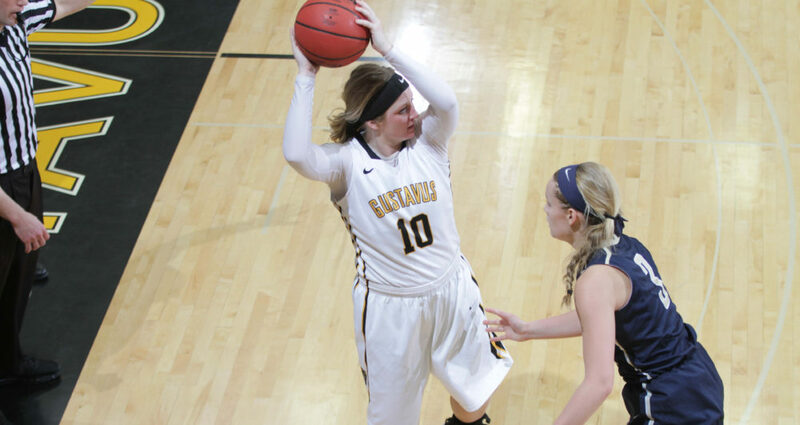 ST. PAUL, Minn. – The Gustavus women’s basketball team closed out the regular season Saturday with a 77-66 victory at St. Catherine. The Gusties, who secured the No. 3 seed for the MIAC playoffs, improved to 20-5 overall and 14-4 in the league. St. Kate’s captured the No. 6 and final playoff spot, meaning Gustavus will host the Wildcats at 7 p.m. Tuesday in the first round of the conference playoffs. The first quarter featured four ties and five lead changes, resulting in a slim 18-17 advantage for the Gusties. The Wildcats were able to tie the score 20-20 early in the second quarter before the Gusties finished the half with a 10-3 run and never relinquished the lead. After leading by as much as 19 to start the fourth quarter, St. Kate’s put together a comeback effort with 10 unanswered points early in the final frame, but the Gusties pushed back and didn’t allow the home team to come within eight points of the lead. Gustavus shot nearly 49 percent from the floor (30-62) and out-rebounded the Wildcats 37-32. The Gusties also forced 26 turnovers and scored 35 points off the takeaway. Mikayla Miller (Sr., Goodhue, Minn.) was two points shy of her program record 34 points in a single game, scoring 32 on 13-of-20 shooting from the floor, along with five rebounds, five assists, and six steals. Miranda Rice (Sr., Forest Lake, Minn.) added 19 points and Justine Lee (Jr., Dawson, Minn.) had 12.